Believe me!! It really feel good when you get to update your tablet or smartphone in terms of OS. Saying this, I must tell you that there have been number of upgrades in the latest Xolo Play Tegra Note 7 and all of this is due to their OS upgrade to Android v 4.3. Let us tell you in detail about the number of feature which it provides you. A new feature for the left-handed users has been introduced which will make it really comfortable for them to use the stylus. This new feature of Direct Stylus can be used by the users to write on the screen with the help of a passive stylus which are easily available in the market with 5 mm width of the tip. The opposite end of this stylus can be used as an eraser. The touch feature and the image processing ability of Xolo Play Tegra Note 7 detect the difference in the strokes and thus known that stylus is being used as a pen or an eraser. The camera of Tegra Note 7 gets the update of AOHDR (Always on HDR) which means that by default the image capturing will be accompanied by this feature. Apart from this you also have the video stabilization feature which helps you to capture the videos in a better way (by removing the disturbance due to shaking of hands). Now the users also have the feature of transferring or installing the applications on external memory storage device. 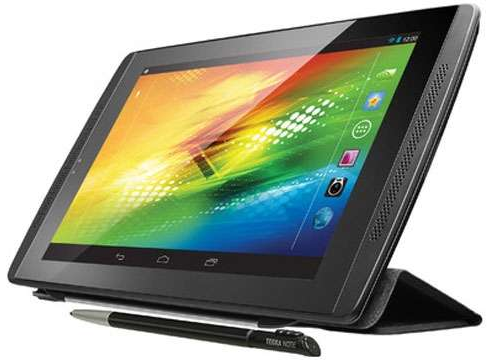 Xolo Play Tegra Note 7 has been launched recently and even the upgrade has arrived. These are the good measures taken to increase the sales of the product. We hope to see another upgrade to Android 4.4 Kitkat soon.